The wineries of Somerset Wine Trail each bring a signature style to their hand-produced, artisan wines from grape varieties specially selected for each vineyard and for our region. VISIT FOUR WINERIES WITHIN MINUTES OF EACH OTHER IN MIAMI COUNTY! 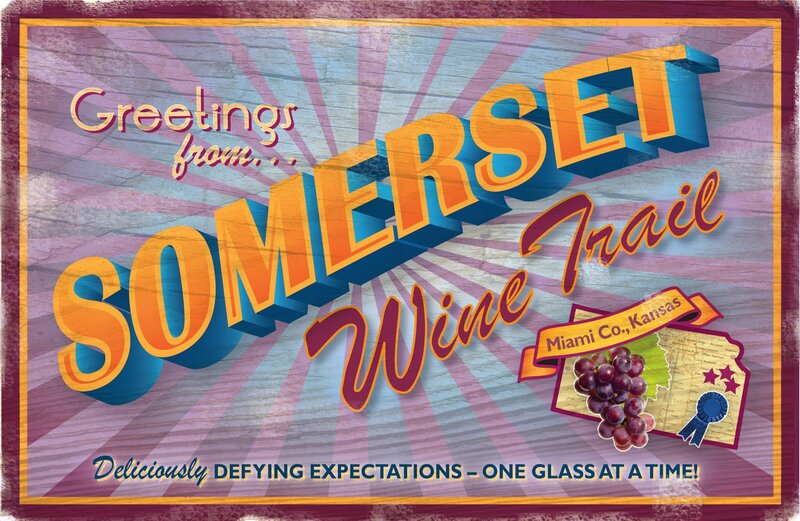 SOMERSET RIDGE makes eighteen different wines, including their national award-winning Citron and Octoberfest. With music and art events most weekends, it’s a great place to stop and enjoy delicious local food and wine. Located at 29725 Somerset Road, Paola, KS 66071. 913.294.9646 Wednesday through Saturday 11:00 a.m. – 5:00 p.m. – Sunday 12:00 – 5:00 p.m.
NIGHTHAWK VINEYARD & WINERY sets among the tranquility of a century old wanut grove and offers a rustic and charming environment. These artisan Kansas wines range from a full bodied red to a delectable dessert wine. Located at 16381 West 343rd Street, Paola, KS 66071. 913.849.3415 Friday and Saturday 11:00 a.m. – 5:00 p.m. – Sunday 12:00 – 5:00 p.m.
MIDDLE CREEK WINERY’s charmingly renovated tasting room was originally the barn, and now serves twelve hand-crafted wines from Kansas grapes, honey and fruits, including six award winners to date! Picnics are welcome. Located at 4353 W. 351st Street, Louisburg, KS 66053. 913.377.4689 Friday 12:00 – 5:00 p.m. – Saturday 12:00 – 6:00 p.m. – Sunday 1:00 – 6:00 p.m.
NEW LANCASTER GENERAL STORE The General Store serves as an outlet of Middle Creek Winer – serving artisan Kansas wine and wine tastings. In addition, the General Store has local, handcrafted goods including art, crafts, gifts and foods available. Built in 1874, this landmark is rich in history. Open Saturday 10:00 a.m. – 5:30 p.m. – Sunday 12:00 – 5:00 p.m.